Glen Cottage at Lock 6, the only picture seen of it from this side. 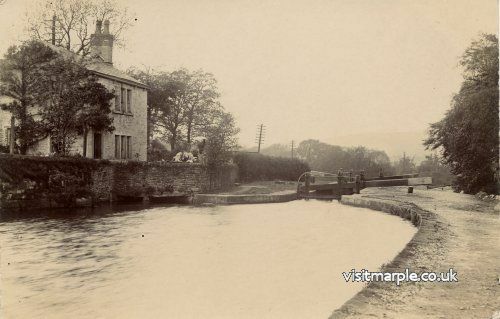 A view of Glen Cottage, the former Lock keeper's cottage next to Lock 6. 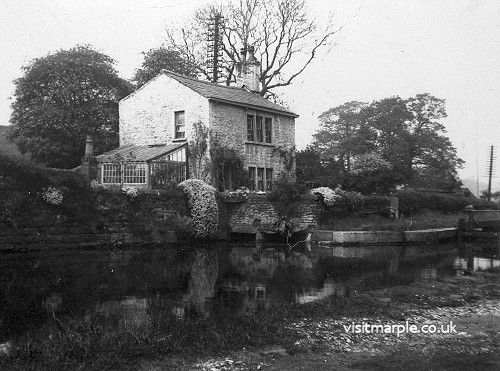 Glen Cottage at Lock 6, demolished in the 1960s. The watercolour below, purchased on e-bay, was painted by the artist John Tuson on 24 May 1963 and, as can be seen, the cottage was derelict at that time. Painting by John Tuson now in the Ring o' Bells Public House. On the tow path side just above Lock 6, virtually hidden by trees and undergrowth, can be made out the remains of an old side pond. It still has water in it but is no longer functional. Quite often a heron can be seen here, silently stalking his prey. Watercolour painting - John Tuson.